Pure lateral dislocation of elbow is a rare injury in children’s and a trial of close reduction should be given prior to surgery. Authors: Sudhir Shyam Kushwaha , Madhuresh Kumar , Kumar Shantanu , Deepak Kumar . Department of Orthopaedics, King George’s Medical University, Lucknow, Uttar Pradesh. India. Lucknow – 226 003, Uttar Pradesh. India. Introduction: Dislocations of elbow constitute about 3–6% of all injuries occurring around elbow in children. Posterior dislocations are the most common type, whereas other types of dislocations, especially lateral dislocation in a child are extremely rare. 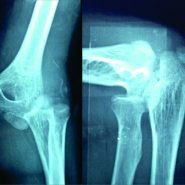 Case Report: A 9-year-old boy with a history of trauma presented with complaints of pain, swelling, and difficulty to move his left elbow. 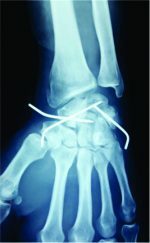 Radiographs revealed lateral dislocation of elbow associated with avulsion of medial condyle. Closed reduction was done successfully under short general anesthesia. Conclusion: Pure lateral dislocation of the elbow is rare in pediatric age group. Lateral elbow dislocation is mostly managed surgically, but a chance of conservative management should be given before surgery. Keywords: Elbow dislocation, falling over outstretched hand, medial condyle. Dislocations of the elbow in pediatric age group are not a common injury. It constitutes about 3–6% of all injuries occurring around elbow in children . Hyperextension injury or falling over outstretched hand is the most common mechanism of injury, which explains the predominance of posterior dislocations; whereas other types of dislocations such as anterior, medial, and lateral are extremely rare . In our best of the knowledge, pure lateral dislocation has been reported mainly in the adults [3, 4, 5, 6]. Hence, in the view of rare occurrence, especially in children this case of pure lateral dislocation is being reported. A 9-year-old village boy fell off the roof 2 h ago and was brought to our orthopedic emergency with complaints of pain, swelling, and difficulty to move his left elbow with other associated injuries. On examination, his forearm was in semi-prone position while the elbow was in 20° of flexion. He had swelling more over the lateral side of elbow which was bony hard in consistency. There was diffuse tenderness over the elbow. There was no associated neurovascular deficit in the left upper limb. Anteroposterior (in maximum extension possible) and lateral radiographs inflexion were taken which showed a pure lateral dislocation of the left radius and ulna in respect to humerus with associated avulsed medial condyle (Fig. 1). There was no anterior or posterior displacement. General blood investigations were done as a routine process, keeping open reduction in mind, in case, there is failure to do so by closed reduction. The patient was taken in the procedure room where he was administered short general anesthesia and closed reduction was done successfully by giving longitudinal traction in the axis of the left arm, and a medial push over the elbow was given simultaneously. After the reduction, full range of passive movement was present at the elbow joint, and there was no ligamentous instability. Further, the reduction was confirmed under image intensifier. Later, a plaster of paris cast was applied for 3 weeks. Post-reduction radiograph taken on the next day showed congruous elbow joint in both antero-posterior and lateral plane (Fig. 2). Outcome and follow-up The patient was called after 3 weeks for first follow-up, and the plaster cast was removed, the patient had mild pain over his elbow while doing movements. Therefore, hot fomentation and elbow mobilization exercises were encouraged. He again came for follow-up after 3 weeks, by this time he had regained his full range of movement except he was 10° short of full extension which improved with the help of physiotherapy in the next 2 weeks. Dislocations of the elbow in children are uncommon as compared to adults. Postero-lateral dislocations are the most common of all, and conservative management is mostly preferred. 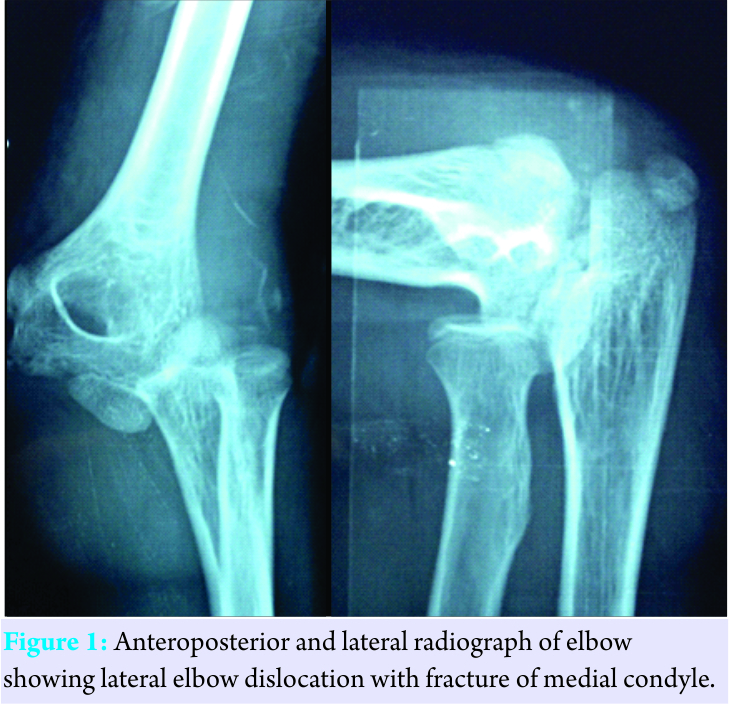 Isolated lateral elbow dislocation is an extremely rare entity. Lateral dislocation consists of dislocation in the transverse plane without antero-posterior translation. Three types of lateral dislocations are described in the literature – complete with pronation of the forearm, complete without pronation of the forearm, and incomplete dislocation . Medial epicondyle fractures can be found in association with lateral dislocation. Its importance arises in children because unlike adults injury to medial ligament can result in Salter-Harris Type I injury . Medial condyle fractures in children can really be confusing with the trochlear and olecranon ossification centers. In our case also, the medial condyle fracture was initially not appreciable which became evident after reduction. Controversy arises on the management of these fractures as few authors have stressed on fixation of these fragments to prevent instability and non-unions, condylar entrapment and in cases of significant displacement (>2 mm) [9, 10, 11]. Lateral dislocations are usually associated with severe soft tissue damage so pure dislocations can be reduced by closed methods . However, closed reduction is not successful in majority of cases owing to swelling, associated fractures, and soft tissue interposition . Anconeus muscle , brachialis muscle , brachialis, and coronoid fracture  have been reported as the cause of failure of close reduction after lateral dislocation of elbow in adults. Intraarticular fragments from the avulsed medial epicondyle or the lateral condyle may prevent reduction in pediatric age group . Ulnar and radial nerves are the most common nerve injuries associated with these dislocations . Majority of the authors advocate surgical management of lateral dislocations in adults, but data on the management in children’s are scarce. Lateral elbow dislocation is mostly managed surgically, but a chance of conservative management should be given before surgery. Dislocations are rare in children’s as compared to adults. Lateral dislocation of the elbow is a rare entity in children’s. They are mostly managed surgically, but before surgery, a chance of conservative management can be tried with excellent results. 1. Wilkins KE. Fractures and dislocations of the elbow region. In: Rockwood CA, Wilkins KE, King RE, editors. Fractures in Children. 4th ed., Vol. 3. Philadelphia, PA: Lippincott-Raven; 1996. p. 653-887. 2. De Palma AF. The Management of Fractures and Dislocation. Philadelphia, PA: W.D. Saunders Co.; 1959. 3. 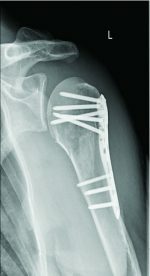 Khan SK, Chopra R, Chakravarty D. Successful closed manipulation of a pure lateral traumatic dislocation of the elbow joint using a modified Stimson’s technique: A case report. J Med Case Rep 2008;2:170. 4. José RL, Pozo RJ, Renato L. Elbow bilateral lateral dislocation. Actaortop Bras 2006;14:42-3. Available from: http://www.scielo.br/scielo.php?script=sci_arttext&pid=S1413-78522006000100009&lng=en. [Last cited on 2016 Nov 03]. 5. Chhaparwal M, Aroojis A, Divekar M, Kulkarni S, Vaidya SV. Irreducible lateral dislocation of the elbow. J Postgrad Med 1997;43:19-20. 6. Exarchou EJ. Lateral dislocation of the elbow. Acta Orthop Scand 1977;48:161-3. 7. Speed K. Dislocations at the elbow. In: A Textbook of Fractures and Dislocations. 3rd ed. Philadelphia, PA: Lea and Febiger; 1935. p. 509. 8. Rasool MN. 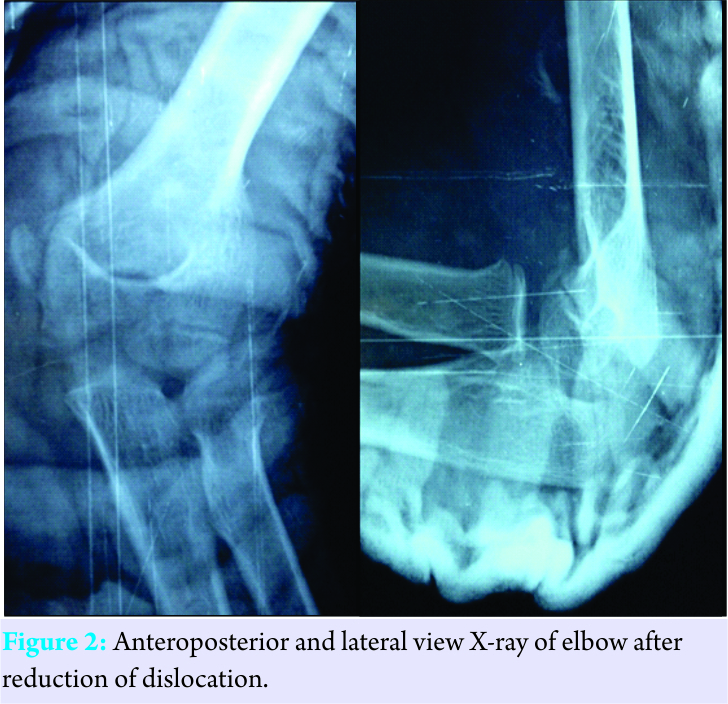 Dislocations of the elbow in children. J Bone Joint Surg Br 2004;86:1050-8. 9. Fowles JV, Slimane N, Kassab MT. Elbow dislocation with avulsion of the medial humeral epicondyle. J Bone Joint Surg Br 1990;72:102-4. 10. Carlioz H, Abols Y. Posterior dislocation of the elbow in children. J Pediatr Orthop 1984;4:8-12. 11. Roberts PH. Dislocation of the elbow. Br J Surg 1969;56:806-15. 12. Vijaya S. Lateral dislocation of the elbow joint. Singapore Med J 1966;7:139-41. 13. Dharmshaktu GS, Singhal A. Lateral dislocation of the elbow: A report of two cases and literature review. Clin Transl Orthop 2016;1:79-82. 14. Smith MF. Surgery of the Elbow. Springfield, Illinois: Charles C Thomas; 1954. p. 233.